"While the news focus has been on the lowest ice extent since satellite monitoring began in 1979 for the Arctic, the Southern Hemisphere (Antarctica) has quietly set a new record for most ice extent since 1979. This can be seen on this graphic from this University of Illinois site The Cryosphere Today, which updated snow and ice extent for both hemispheres daily. The Southern Hemispheric areal coverage is the highest in the satellite record, just beating out 1995, 2001, 2005 and 2006. 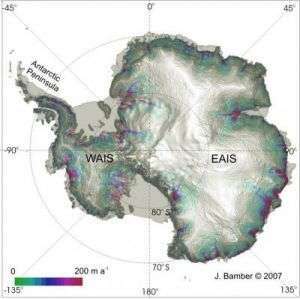 Since 1979, the trend has been up for the total Antarctic ice extent."